What is the Veterans Aid & Attendance pension benefit? Who is eligible for the A & A pension benefit? The special case of Long Term Medical Costs. Using aid & attendance to pay any one for care at home. Using aid & attendance for professional home care. Using aid & attendance for to pay for assisted living. Using aid & attendance for to pay for a nursing home. The application process for aid and attendance Pension. Using an aid & attendance benefits consultant. 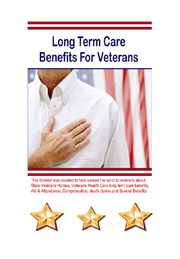 Please fill out the form below, and if you choose, I will send the Free booklet "Long Term Care Benefits for Veterans." This booklet describes the long term care benefits available to veterans or their surviving spouses while paying particular attention to the Pension or as it's more commonly called "aid and attendance benefit." I am not affiliated or connected in any way with the US Department of Veterans Affairs.